I am always looking for a fresh, new twist on side dishes this time of year. With the plethora of family dinners, fancy meals and potlucks around the holidays, it is nice to mix it up from the old sweet potato casserole standby, low on my list of holiday favorites. Instead, I’ve created a much fluffier and healthier version (holidays and healthy? gasp!). I brought this dish to serve my family on Thanksgiving. It was gobbled up. In a large stock pot, fill with water until potatoes are covered. Boil until sweet potatoes are softened, about 15-20 minutes. Strain. Add milk and butter and mash until smooth. Crumble goat cheese and gently mix in with a rubber spatula or spoon. Add pepitas and fold in. 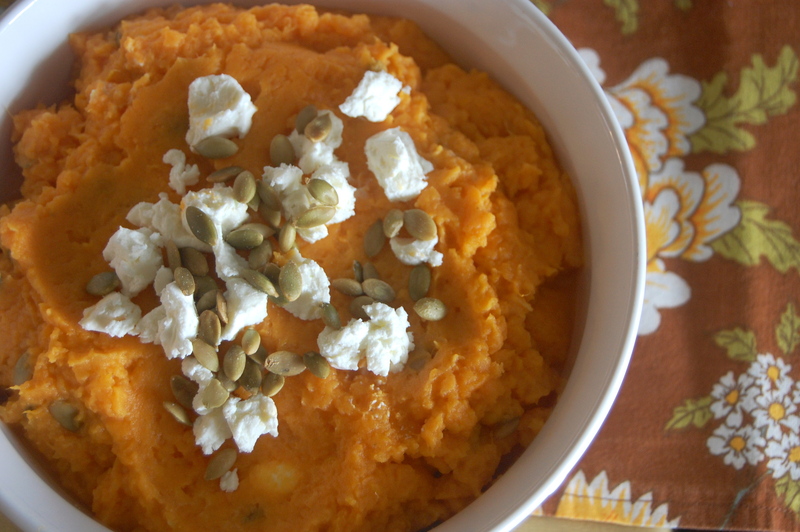 Top with goat cheese and pepitas before serving. The salty pepitas add a nice crunch to this smooth dish. These are a great side dish with turkey, pork or a good barbecue meal! 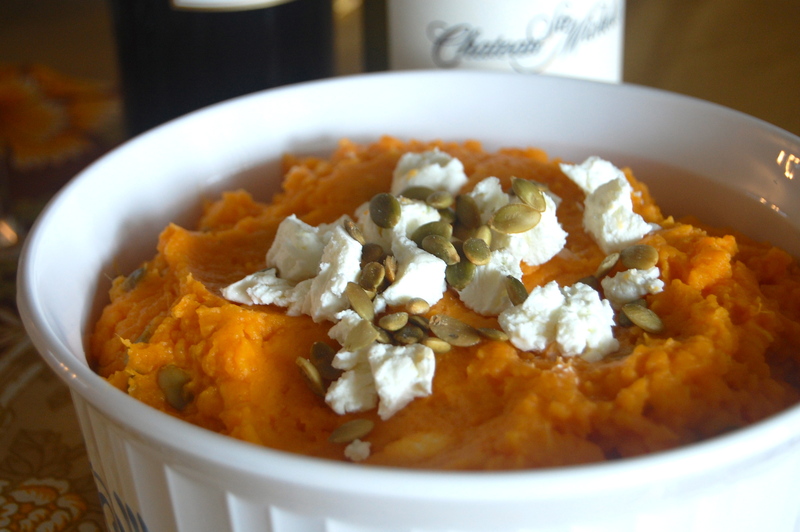 I’ve been on a sweet potato kick lately and this looks delicious! I was planning to bring sweet potatoes with creme fresh to Christmas, but maybe I’ll go crazy and make this healthier version instead! @Emily – let us know if you do! I can’t wait to eat these again.